La Paz has a big community of cruisers, mostly from the US and Canada. The Cruceros cruisers club had taken upon them to organize a Thanksgiving potluck this year again. Apparently they have been doing that for the last 17 years or so. The cutoff was at 220 people and you had a small fee of 50 pesos per person at the entrance to cover the cost of the turkey which was provided. The party took place at Marina Palmira at 2pm. That marina being one of the furthest south, we decided against the 45 minute walk because we had volunteered to bring mashed potatoes and corn and had no way to keep it warm for that long, and on top of it, 2 pm is Grace’s usual naptime and dragging a cranky toddler for that long didn’t sound like much fun. We found that the cheapest way to get there was to share a taxi with other cruisers. We ended up paying 60 pesos roundtrip which was more than reasonable! After having 3 days of constant wind, Thursday seemed very hot and “still”. Fortunately, we got there early enough to find a good table with shade which made the whole experience a lot more enjoyable. The potluck was very nice with a LOT of food and even more diversity! Many different dish of mashed potatoes, baked potatoes, potatoes au gratin, rice, gravy, many kind of salads and veggies, and even more kind of desserts! Everybody had a very full plate and most people even went for seconds. I had the feeling that everybody was stuffed and enjoyed their day together. It definitely felt like Thanksgiving! Grace had a great time as well. Her very part of the day was to be little enough to be able to cut through the whole line, stand almost under the dessert table and barely reach with one hand to grab yet another piece of cake. Most of the time, nobody would even notice her! The rest of the time, she would just use of her cuteness to get her ways as usual! By the end of the day she was as stuffed as the rest of us!! On our way back we stopped by the playground but she wouldn't have any of that. Instead she asked to go to the cruisers library where you can trade books so she could "read". It was a good day indeed! As many of you know, I had applied for my American citizenship and I was awaiting the time and date of the oath ceremony. Even though we changed our address, USCIS still managed to send the letter to our old address. We ask the realtor agent who is in charge of the house if she could check the mailbox which she kindly did but there were no letter in there! I called the USCIS office to see if they could help me with the matter. As usual they were useless. They apparently don’t know when the ceremony is and told me that the only way to know was to either go in person to my designated office, to get the letter or to order a new one after waiting 30 days. Being fairly sure that the ceremony would be within 30 days, we had to find another way to get the letter. We called the Camarillo post office who told us that indeed they had our mail and we arranged for a good friend of ours to get it. She emailed us back on Wednesday November 19th at 6pm that the ceremony was to be held on Friday November 21st at 9am. Wait... What?!? We quickly gathered our thoughts on how to get there on time. There was no way we were going to catch a plane so Nathan raced to the closest Hertz office. He got there only minutes before they closed! In the meantime, I packed enough clothes for 3 days, a nice outfit for each of us, all the paperwork we would need for the ceremony, our passports and some leftover food, water and snacks to see us through the trip to Los Angeles. By 9pm, the car was loaded and we were on our way to Los Angeles. Having already done the drive before, we knew what to expect. The view was spectacular during the day and the military personal was friendly and helpful at each checkpoint. As long as you stop every time you see a gas station to top off, gas in not an issue either. After a 24 hour drive, we were in Los Angeles with the precious letter in our possession! 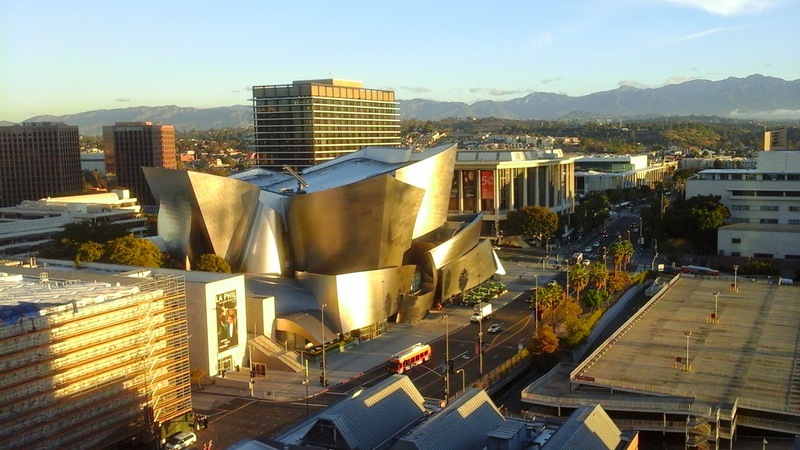 A friend of ours offered that we spent the night at his apartment conveniently located downtown L.A., not even 20 minutes from the ceremony location. We were very grateful for a place to sleep and shower after the crazy drive!! Having never been to an Oath Ceremony before, we were not sure what to expect. All that the letter said was to dress appropriately. Once there, we learned that they were doing a ceremony at 8, 10 and 1pm. Each of which would have about 800 immigrants who would take the oath. The line was huge even though we were there at 8.45 but the organization was impressive. The line was running smoothly and even though it was crowded, we were in fairly fast. You could sense that they are a well oiled machine and that they have perfected their system. As for the process itself, all immigrants stand in line while family and friends go to an area for guest only. You pass a search point then you go to see a USCIS agent who check your letter, punch your green card so it's invalid and ask you a couple of routine questions. 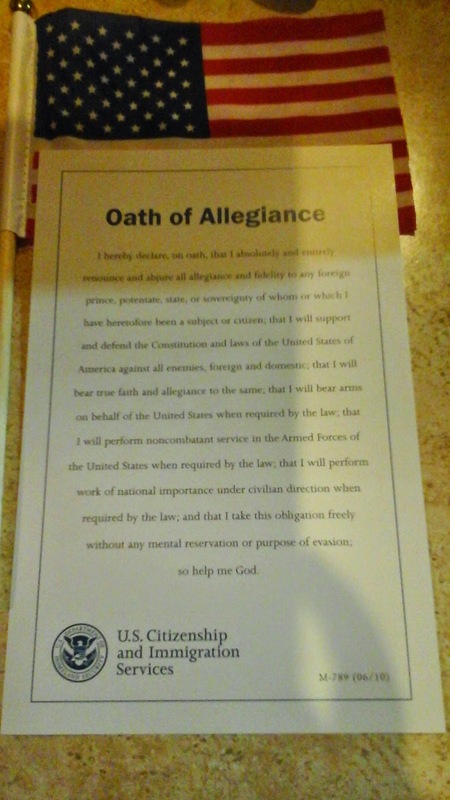 After that you receive a little American flag and an envelop with useful information about voting, getting a passport, a cheat sheet with the oath written as well as the pledge to the flag and the National Anthem , and a welcome letter from the president. You are then seated in a big room which is appointed Federal court room for the day. We were 812 immigrants. Guests are seated in the back or standing on the side but from what Nathan said only about half of the guests were able to get in because there was not enough room for everybody. Then the judge came, we took the oath, watched a video of the president and listened to several speech. The ceremony ended with the pledge to the flag and the National Anthem. The whole ceremony was very emotional but singing the anthem and saying the pledge for the first time was what really got to me! I might have cry but that must have been the pregnancy hormones… Or not! After that the guests exit and we receive our certificate of naturalization. We were done by noon and on our way back to the border. We stopped at a couple of stores in San Diego and picked up mail for cruisers in La Paz. We did one more stopped just before the border to have a nice celebratory dinner at Outback Steackhouse and then we were on our merry way again! The drive back was more exhausting as we had had barely enough time to rest before hand but by 2pm on Saturday we were back in La Paz and very happy to see the sight of Reprieve! Triton, a boat who did the Haha with us, kept an eye on her for us! They said that she behaved herself and didn't cause any trouble. 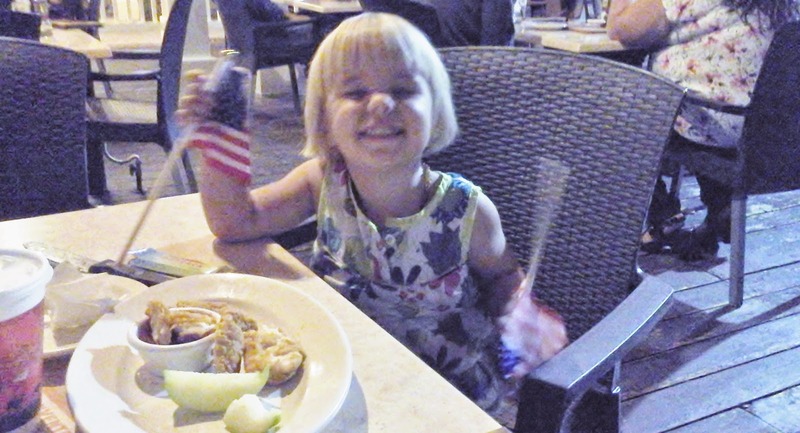 Grace cheered mama on at the ceremony by waving American flags and didn't let go of them for the rest of the day! We learned that, even though frustrating at times, it is possible to travel without phones, gps or reliable internet! We only had my tablet with us (and in my packing frenzy I forgot my charger!) and we stopped at a starbucks after the border to get enough internet to arrange for a place to sleep before my battery died. We apologize for not telling anybody about our trip back or the ceremony. But we were not even sure that we would make it! Thank you so much to Marie-Noelle, Vision and for helping us on short notice like that! We are very very grateful!!! Sorry for not posting sooner. We have been so busy having fun and figuring out how to have both American and Mexican paperwork done that I had no time to write. When you come by boat to a foreign country, you need to go to the first port of entry to do your paperwork. When you get there you need to visit the Port Captain, the Immigration office and the place where you pay for the tax etc (Duana). For us, our port of entry should have been Ensenada but the Baja Haha boats get an exemption because the rally doesn’t stop there. You should do it when you get to Cabo. We got to Cabo Friday evening and the office was close until Monday. We left Sunday with the intention to take care of it all first thing when we get to La Paz. We arrived in La Paz Thursday early evening so next morning we got ready for a lot of walking as the port captain is about 5 miles away from Marina de La Paz where we are anchored. It is a good thing that we can’t see in the future because it was a LOT more walking that we had anticipated!! It was about 90 degrees out but it was nice to get out and discover the city. The Port Captain told us that we got it wrong and that first we had to go by the Immigration to fill out the paperwork and get our visas and then we should come back to see him. Rookie mistake! From the map we had the immigration office was supposed to be only a couple of blocks from the Marina, unfortunately when we got there we discovered that our map was wrong, the immigration office was about 4miles on the opposite side of town!!! Not totally discourage yet, we walked there. Nathan with the heavy backpack on his back and me with a sleeping Grace wrapped on my back. By then we were super hot and not amused anymore. We got to the immigration office at 1.01pm. The guard in front of the door was prompt to show us the hours on the door which of course said that it’s open from 9 to 1pm… And that it was closed on Monday for a local holiday. Disappointed and frustrated we decided to go to Walmart to get some fresh fruits and veggies so at least we had not totally lost our day. A bus sounded like the cheapest way to do it so we once again walked to the main street where we had seen a couple of buses. You just hail the bus here so we walked toward the store and stopped the buses as we saw them. We couldn’t quite figure out why but for some reason none of them were going to Walmart. Having walked another mile or so, we were considering taking a taxi home and call it a day! A car was stopped near and as we walked by to find a taxi he asked us where we were going. We told him Walmart to which he replied to hop in as it was on his way. We gladly accepted and piled up in his pick up with his girlfriend, daughter and aunt. Saying that the car was packed would have been an understatement but we have never been so happy to be in a car! After cooling down, eating lunch and buying some groceries we discovered why we couldn’t find any buses… The Baja 1000, an off road race was on and the finish line was right in front of Walmart, blocking the access to the major road. The police was nice enough tell us where to find the bus home. At last, we were home!! Tuesday we went back to the Immigration office. They told us that we needed the only paper that we didn’t have with us and photocopies of everything so Nathan ran the 4 miles back to the boat while Grace and I waited with an ice cream at the Dairy Queen nearby. Back to the office, we gave them everything and after about an hour wait, they told us that we had to pay a fee but that they don’t handle the money, we had to go to a bank. Luckily, the bank was only 4 blocks away. By then it was 1 but they still let us in since they were already working on our papers. By 3 we were out with our visas and the paper for the port captain. Of course by then , the port captain office was closed. Wednesday, we went by the port captain office and finally everything went smoothly. We were done within the hour, and felt accomplished to have overcome the Mexican maze of paperwork!! A lot of people seemed to have concerns about Grace, her wellbeing, her socializing, and about her being "stuck" on a boat! I thought that I could give you a peak into her daily life to give you a better understanding of what it looks like. While cruising the world, we should be out sailing about 25% of the time, the rest will be spend at the beach or exploring our surroundings. While we are "stuck on the boat" though Grace still has options on what she can do. She has about 50 dvds that she can watched. She also has a playroom full with legos, dolls, books, cars, a white board, etc She loves to use the cockpit to set up a whole doll nursery! But her absolute favorite is to talk on the VHF radio!!! When we are anchored out, she likes to play on her swing or in her kiddie pool on the deck. If we fill it up in the morning, it's nice and warm in the afternoon! She is also a big fan of going around in her little kayak or just playing in the waves. On Sunday we left Turtle Bay for Bahia Santa Maria. It was a beautiful day and the forecast predicted 10 to 25 knots winds with 5ft waves that would be far enough apart to be just big lazy rolly waves. An excellent forecast for some good sailing. And we were not disappointed!!! We sailed the full 36 hours that it took us to get there averaging 8 knots and going as fast as 12 knots while surfing the waves! It was a very enjoyable ride going up and down the waves like somebody was rocking you gently! Bahia Santa Maria is a very peaceful and secluded anchorage. Its about 11 miles long and nicely sheltered from the winds and waves. There is no town or anybody living there. However, every year when the Baja Haha rally stop there, a rock band and a taco shop take upon themselves to make the difficult trip to reach the bay! It was pretty amazing to hear a rock band in the middle of nowhere! Grace spent her day playing in the warm tide pools with other boat kids and even took a hike with papa up the mountain. Another great day in paradise! This morning at 6.30am we left for our last leg of the rally. It should take us anywhere between 24 and 30 hours to reach Cabo San Lucas. Once there, we will have internet and I'll upload some of my favorite pictures! So far we had not much wind and the whole fleet is motoring! Everybody in the fleet seems in a great mood and is chatting on the VHF about fish caught, plans are being made about trips ashore to reprovision and medical advice are given for some minor injuries.